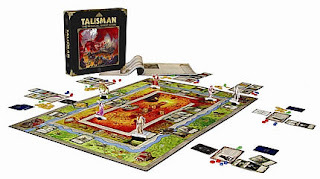 Talisman is an old classic, which has been re-released in these days by Pegasus Spiele and Fantasy Flight Games (4th Edition). It's a game full of heroes and villains, of sorcerers and monsters. It's a about fighting and surviving in a fantasy world, with the goal to finally claim the Crown of Command and become the true ruler of the kingdom. The (rather huge) game board is made of thick cardboard and will endure a lot of exciting sessions. The different characters are represented by fine plastic miniatures. Additional cards, coins, counters and a rules booklet comes with the box - whereas the rules booklet is clearly arranged. The artwork in general fits the fantasy theme quite well. First of all you choose a character (out of twelve possibilities) for your adventure. Then an usual turn consists of two phases: movement and encounters. After moving to a new space (according to the dice roll) you can decide whether to encounter another character (usually meaning to attack him) or the space itself (meaning to draw adventure cards and act according to the instructions given). As the game proceeds you try to improve the abilities of your character steadily and to collect objects and spells, to be in a good position when fighting other characters or monsters, and to be finally well-prepared to capture the so-called "Crown of Command" (which basically means to win the game). It's a lot of fun to work on surviving with your character in this fantasy world. It is an entertaining journey with a lot of diversity due to the different characters and the huge amount of objects, spells and adventure cards. If you don't expect this to be a pure strategy game and if you accept the fact that quite some luck (dice rolls as a means to simulate fate) is necessary in order to win, you will like this game. But be prepared that it can take some time until your character is strong enough to face the final challenge - but there are ways to speed up gameplay if you want to. Talisman is an old classic, and deservedly so. If you are interested in the fantasy adventure genre, you definitely should check out Talisman. 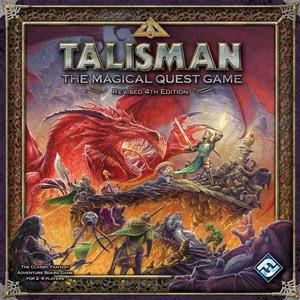 From the publisher: Talisman takes you on a journey through magical lands, as you endeavor to reclaim the Crown of Command. Each turn will see your hero advancing, battling, gaining knowledge and power necessary to defeat the guardians lurking between the Portal of Power and the Valley of Fire.